Radiance is a very elegant Depression era pattern that was produced by New Martinsville Glass Company from 1936 to 1939. The pieces are ground and polished on the bottom edges and the color is very rich. 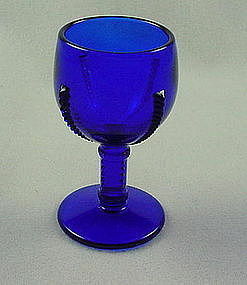 Offered here is the 1 oz cordial in cobalt blue. 2 5/8 inches high, I have 2 available. Price is per stem. These are very hard to find so grab them while you can. See my other listings for a ruby condiment set in this lovely pattern.